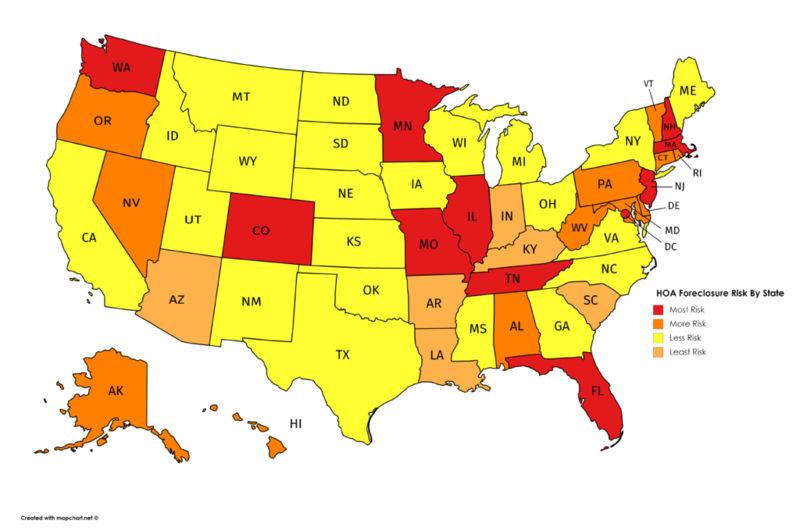 Home › Blog › Avanta › HOA Foreclosure Risk At-A-Glance – How Does Your State Measure Up? More than 67 million Americans live in communities governed by a Home Owners Association (HOA). HOAs provide many benefits to their members. Provision and maintenance of common spaces and amenities like pools, dog parks, and fitness centers, providing guidelines for the look and design of the overall community, and funding for maintenance and upkeep of lawns, landscaping, and green spaces. A well run and funded HOA can also help increase or maintain community property values – a boon to both homeowners and lenders. Like property taxes for local governments, HOA assessments and dues on units fund the essential operations of the community. When large numbers of unit owners default on their mortgages and stop paying their assessments, the financial stress on an HOA’s finances can become extreme. To ensure HOAs can collect unpaid assessments, some state legislatures have given them the right to initiate foreclosures. Many state laws give community associations “super-priority” liens on dwellings whose owners have not paid their assessments – or Super Liens. Super Liens give HOAs the power to initiate foreclosures and get paid ahead of the traditional first-lien position held by a mortgage lender. Currently, 24 states are considered ‘Super Lien’ states – the HOA can take 1st Lien position if HOA dues become delinquent. Although these types of scenarios are scary for many lenders and servicers, state legislation clearly outlines the rights of the lender and the HOA during the foreclosure process for Super Lien states. What about Non-Super lien states? Where do they fit into the overall foreclosure risk equation? The lack of Super Lien status does not eliminate HOA foreclosure risk. Legislation and guidelines can get a little fuzzy. Laws, rules, and guidelines for HOA’S are governed by a large variety of independent state statutes, individual HOA covenants, conditions, and restrictions (CC&Rs) or both. Using Arizona as an example, the HOA does not have to record a lien if placed on a property for delinquent HOA assessments making it difficult for lenders to track and manage any loans that may be in jeopardy of foreclosure. In addition, many states also have provisions for expedited or non-judicial foreclosure proceedings. These arrangements can shorten the time periods for foreclosure action and reduce a lender’s ability to respond in an appropriate time-frame. We conducted a state-by-state analysis of HOA Foreclosure statutes, regulations, and dominant HOA CC&Rs. Using our own risk management algorithms, we developed a Risk Scale based on Super Lien status, foreclosure notice regulations, and provisions for judicial and non-judicial foreclosures. Is your state an aggressive HOA foreclosure state? Use this HOA Foreclosure Risk Map to see how your state measures up.